ArcticDEM is an NGA-NSF public-private initiative to automatically produce a high-resolution, high quality, digital surface model (DSM) of the Arctic using optical stereo imagery, high-performance computing, and open source photogrammetry software. Sign up for the ArcticDEM Newsletter! The ArcticDEM project is a response to the need for high quality elevation data in remote locations, the availability of technology to process big data, and the need for accurate measurement of topographic change. The producers did not intend for the final product as a single “eyes on” or edited product, but rather a collection of time-dependent elevation models and the infrastructure to process the flow of imagery from an ever-expanding constellation of satellites producing an ever-increasing volume of high-quality data. ArcticDEM data is constructed from in-track and cross-track high-resolution (~0.5 meter) imagery acquired by the DigitalGlobe constellation of optical imaging satellites and licensed through the NGA NextView contract. The majority of ArcticDEM data was generated from the panchromatic bands of the WorldView-1, WorldView-2, and WorldView-3 satellites. A small percentage of data was also generated from the GeoEye-1 satellite sensor. Upon completion, ArcticDEM encompasses all land area north of 60°N. In addition, coverage includes all territory of Greenland, the State of Alaska in entirety, and the Kamchatka Peninsula of the Russian Federation. The project began with a release of data over Alaska in September 2016 and continued to other regions on a continual basis over two years. The objective of the ArcticDEM initiative was to create a comprehensive elevation model of the Arctic within the two-year term of the U.S. Chairmanship of the Arctic Council, which began in April 2015. The ArcticDEM domain, shown in black, includes all land area north of 60°. ArcticDEM data is generated by applying stereo auto-correlation techniques to overlapping pairs of high-resolution optical satellite images. Using the Surface Extraction from TIN-based Searchspace Minimization (SETSM) software, developed by M.J. Noh and Ian Howat at the Ohio State University, stereopair images are processed to Digital Elevation Models using compute resources provided by the Blue Waters supercomputer located at the National Center for Supercomputing Applications at the University of Illinois at Urbana-Champaign. Output DEM raster files are being made available as both “strip” files as they are output directly from SETSM and preserve the original source material temporal resolution, as well as mosaic files that are compiled from multiple strips that have been co-registered, blended, and feathered to reduce edge-matching artifacts. The time-dependent nature of the strip DEM files allows users to perform change detection analysis and to compare observations of topography data acquired in different seasons or years. The mosaic DEM tiles are assembled from multiple strip DEMs with the intention of providing a more consistent and comprehensive product over larger areas. ArcticDEM Release 7 includes 185,800 new 2-meter resolution DEM strips and a re-release of the previous 75,000 strips with improved data filtering algorithms. These data cover the entire ArcticDEM domain. Production enhancements include improved filtering to preserve coastlines and better resolve densely-forested areas that are subject to seasonal variation. The entire ArcticDEM domain was re-mosaicked with the additional DEMs in order to fill gaps from previous releases. The total mosaic includes 2,488 tiles at 2-meter resolution (distributed as 9,228 sub-tiles). Reduced-resolution versions of the mosaic are also available at 10 meters, 32 meters, 100 meters, 500 meters, and 1 kilometer for cartographic uses. Strip DEM files correspond to the overlapping area of the input stereopair image swaths as they are collected by DigitalGlobe’s constellation of polar-orbiting satellites. Strip DEM dimensions will vary according to the satellite sensor that acquired the images and the off-nadir angle of collection. Most strips are between 16 km and 18 km in width, and 110 km and 120 km in length. Strip DEM files are provided at 2-meter spatial resolution in 32-bit GeoTIFF format. Elevation units are meters and are referenced to the WGS84 ellipsoid. Strip DEM files include metadata text files describing the xyz offsets to filtered IceSAT altimetry data, although these translations have not been applied to the DEM files. Mosaicked DEM files are compiled from from the best quality strip DEM files which have been blended and feathered to reduce void areas and edge-matching artifacts. Filtered IceSAT altimetry data has been applied to the raster files to improve absolute accuracy. Mosaicked DEM files are distributed in 50 km x 50 km sub-tiles. Mosaicked DEMs are provided at 2-meter spatial resolution in 32-bit GeoTIFF format. Reduced resolution versions are also available at 10 meter, 32 meter, 100 meter, 500 meter, and 1 kilometer resolutions. Elevation units are meters and are referenced to the WGS84 ellipsoid. Refer to these guides for official ArcticDEM information & acknowledgement. Along with acknowledging the PGC, the ArcticDEM dataset should be cited as follows. Porter, Claire; Morin, Paul; Howat, Ian; Noh, Myoung-Jon; Bates, Brian; Peterman, Kenneth; Keesey, Scott; Schlenk, Matthew; Gardiner, Judith; Tomko, Karen; Willis, Michael; Kelleher, Cole; Cloutier, Michael; Husby, Eric; Foga, Steven; Nakamura, Hitomi; Platson, Melisa; Wethington, Michael, Jr.; Williamson, Cathleen; Bauer, Gregory; Enos, Jeremy; Arnold, Galen; Kramer, William; Becker, Peter; Doshi, Abhijit; D’Souza, Cristelle; Cummens, Pat; Laurier, Fabien; Bojesen, Mikkel, 2018, “ArcticDEM”, https://doi.org/10.7910/DVN/OHHUKH, Harvard Dataverse, V1, [Date Accessed]. Esri has developed an online web mapping application to explore ArcticDEM data. The full-resolution ArcticDEM strips and mosaics are presented in this web map to quickly preview and explore the elevation data. With this web map, users can visualize the ArcticDEM data, preview the spatial coverage, and download simple exports. The ArcticDEM Explorer is the best way to preview the datasets if no GIS or remote sensing software is available or you simply want to explore the entire dataset quickly. The ArcticDEM Explorer, developed by Esri, allows for visualization and basic analysis of the ArcticDEM products. NGA has also developed an online web mapping application to explore ArcticDEM data. The application features many of the same layers as the Esri ArcticDEM Explorer, but in a different interface. The NGA ArcticDEM Web Map is useful for a spatial search of the ArticDEM index to quickly download one-off DEMs, both strips and tiles. The NGA ArcticDEM Web Map is useful for a spatial search and download of strips and tiles. There is no login required for either application, but if you download or use any ArcticDEM data from these sites (or otherwise), you must adhere to PGC’s Acknowledgement Policy. Use the links below to browse the directory for the entire ArcticDEM dataset. Refer to the documentation to see the directory structure, naming schemes, and download contents. Users familiar with the GNU Wget utility can use the following commands to batch download ArcticDEM data. Please note, the first two commands will download the entire archive, which is over 200 TB for geocells and 18 TB for mosaics. Use the subdirectory examples to limit your download. Windows users may have to add “wget” to PATH in Environment Variables. ArcticDEM can be accessed via web mapping services provided by Esri. The raster elevation data (strips and tiles) are served via an Esri ImageService. We also provide an ArcGIS Online FeatureService for the ArcticDEM mosaic tile scheme (no raster elevation included in this). The GIS layers can be used directly in desktop GIS software. The links below provide URLs to the web services and instructions for how to add and use the data in ArcGIS. Visit the ArcGIS Online item page(s) to download connection files or the indexes in many GIS formats (Esri shapefile, GDB, etc.). For other GIS software packages, consult your software’s documentation. 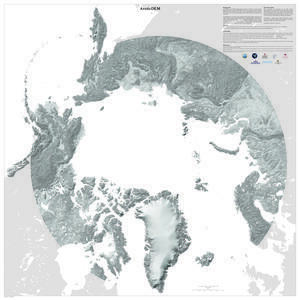 A shaded relief version of the ArcticDEM dataset with voids filled and the resolution reduced is available as a 36″x36″ map poster. There are two versions, one that contains cartographic elements such as cities, research sites, and administrative boundaries and one that is just the hillshade image. The maps can be viewed/downloaded below. Please note, these maps are not for use in GIS.